Mangale is no doubt one of veteran saxophonist Joseph Ngala’s hit songs. It’s simple yet intricately cascading horns section and heady bassline irresistibly grows on the listener – often luring one unwittingly to the dance floor. With its catchy lyrics sung in the indigenous coastal Rabai dialect, this song is still as fresh to the ears as it was when originally composed over three decades ago during the mid 1970s. 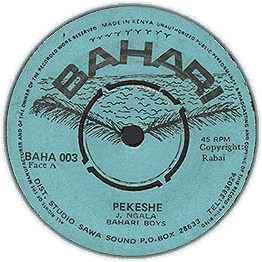 Alongside this Bahari imprint 45 inch flip side track Pekeshe – the twin traditional ‘ballads’ are timeless and enduring – easily resonating with cross-generational audiences. But notably, Mangale must have irrefutably been a somewhat melancholic, yet happy party song as its jazzy-riffs driven refrain attests – wherein the seasoned lead vocalist calls out the names of Bahari Boys Band members – Lubwe, Washo, Ndangu, Mutunga, Chiranzi, Ngala, Funzi and Kondo. This camaraderie trait was common among most closely-knit local bands hailing from the 70s era – with each instrumentalist regularly looking up to rest of crew as a source of inspiration. 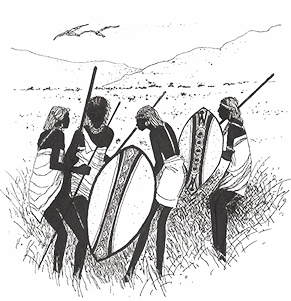 Pekeshe on the other hand still reigns supreme as a popular request song especially during communal events and cultural festivals held seasonally among the Miji-Kenda – nine tribes’ resident along the coastal strip. But more significantly, these now rare 45s double tracks stand out among veteran Ngala’s handful seminal recordings – traced back to an era widely referred to as the golden age of Kenyan music. On top of my kenya wantlist…!